Have you ever seen the movie "Bucket List?" The movie stars Jack Nicholson as a millionaire bachelor and Morgan Freeman as a middle class family man. They meet when they are both being treated for cancer and are forced to share a hospital room. The two become friends and, together, they compose a bucket list of things they want to do before they die. Some of the things are simple like, "laugh until I cry" or "kiss the most beautiful girl in the world." Other things on their list are more far-fetched such as "Climb Mt. Everest." Funded by Edward's (Jack Nicholson) significant funds, they set off together to check everything off their list. I won't spoil the ending of you, but it's a great movie. It was that movie that inspired this Tuesday Ten topic. None of us really likes to think about "the end," but it is, after all, inevitable. We've already shared things we want to learn, jobs we would like to try, and places we would like to see, but, if you had to narrow it down to the top ten things you want to make sure you don't miss in your lifetime, what would they be?? I want to see my three daughters grow up. I want to see what careers they choose, meet their future husbands, and watch them become mothers themselves. I want to see my grandchildren. I'm told that you love grandchildren in a very different way than you love your children. I want to know what they feels like. I want to feel pretty. Whether it's from losing weight or just somehow finding contentment with myself, I want to look in the mirror and think the person looking back at me is beautiful. I'm not exactly sure what specific goal I want to achieve, but I want to accomplish something greater with my writing. I'm not really interested in writing a novel, but I want be published (again) and be at least somewhat "well-known" for something I wrote. See Hawaii. Perhaps because of TV, but I've been interested in Hawaii lately and I want to go there. See more of Europe. I've been to Paris, but I want to see it all and I want to take my girls with me. Go on a Safari. This sounds a little crazy amidst all the Ebola scariness, but I have always thought it would be cool and there is pretty much nothing that would make my oldest daughter happier. Learn to swim - really swim. Like dive off the high dive swim. I'm much more comfortable in the water than I was years ago, but I'm certainly not a good swimmer. I've tried to learn, but fear is a tough thing to overcome. I know this will sound cliche, but I want to make a difference in the world. I'm not Mother Teresa or anything, but I want to go out knowing that some people were better off because of me; that I made their lives easier or happier or somehow better. It sounds simple, but when you really think about it, it's a pretty lofty goal. 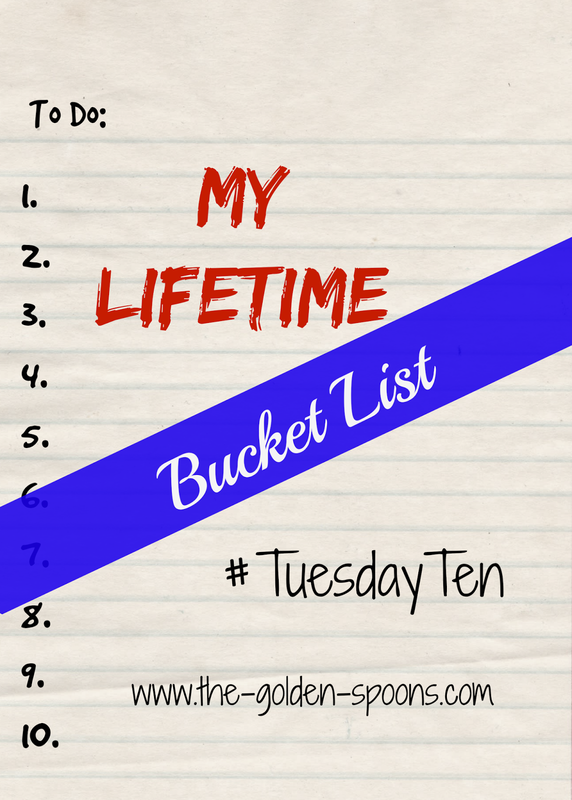 What would be on your bucket list?? 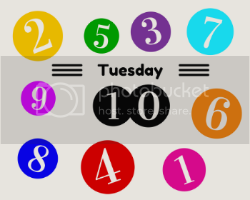 ANNOUNCEMENT: In January, Tuesday Ten will be celebrating it's first birthday!! No birthday celebration is complete without gifts, and we are planning something fun! Want to help and get some social media exposure, too? CLICK HERE to go to a form with more information and instructions. Come link up again next Tuesday, November 25, when we'll share the things we are most thankful for right now as we get ready for Thanksgiving! a lot of the things on your list resonated with me, especially number 3. I have something similar on my own list today. I am exactly the same. We need to learn to love ourselves more. That's a challenging, but doable list, Lisa. I have a lot of travel on my own list. I hope I make it to Alaska, Australia and the Vatican at some point in my life. I am reading this post after reading your bucket list, and I want to say that obviously you have already made a difference in the world, Lisa. You gave a child love and a home when those things were not available elsewhere. I hope that you are able to find CeCe at some point and reconnect. I'm hoping to do #6 this summer! And I think #8 is the easiest to do, and you should totally do it. Splurge at an outlet...I bought a $300+ Kate Spade bag for about $100, and I get compliments almost daily. It still makes me happy two years later. That's a great list. No 6 and no 7 are on my full list too. I learned to swim properly a few years ago but sadly didn't enjoy it as much as I thought I would and haven't really bothered much since ... at least I tried! Thanks, Rabia! I do feel like we made a difference for her. I wish I had known that we wouldn't see her again - I would have done things differently. I would love to reconnect with her someday! If I had to choose only one, that would be it! I saw that on your list, too. We do indeed need to learn to love ourselves! I started to just say "travel more" but then I decided to be a little more specific. That's awesome for this summer! Have you ever been before? Yep - at least you tried! I am kind of claustrophobic, so I don't really like being under water anyway, but I need to be a better swimmer - for safety if nothing else! Nope - none of us have ever been. We are doing Italy and Switzerland, if I can manage to plan such a big trip! Well, I can't help you with those two countries, but it sounds wonderful! Hawaii is on my list too. Hawaii in the winter and Alaska in the summer. If I reversed those two, I'd probably be very sorry. I'd love to feel beautiful too.. before it's too late. I'd love to be a more well-known photographer and writer, and to have a house with a master bathroom suite! With a jacuzzi tub! I think I need to see that movie! I haven't seen it, and it sounds like a good one! I once splurged and bought a $100 dollar purse. I loved that purse, but the lining tore. I used it for a few years before that happened, though! A friend of mine shared a somewhat different kind of list a few years ago. Not a bucket list, but a list of things you want to do not quite so grand. Things like... roll down a grassy hill, tell my friend "X" what a difference he/she made in my life, build a snowman, etc. Smaller "things" that you want to do. Just a thought on this whole thing. I made my list, checked a few things off, but need to get back to it. Sometimes it's the small things that we REALLY want to do! It is a great movie that will make you cry and laugh! Definitely the small things sometimes! That's a great idea! Wow Lisa - powerful list! I want so much of the same things. I very very much hope to see my son grow up and meet his children (I can wait forever and never meet my step daughter's kids haha). Number three makes me sad though. I totally understand and feel ugly but YOU ARE beautiful already. Inside and out. Really. Also, I'm with you on a safari and making a difference in the world. Thanks you, my friend! #3 makes me sad, too, but I'm working on it -trying at least. I really want to learn how to swim too! I can float and dog paddle, that's it! Also, I'd like to go to Bali, Indonesia one day. I think you have already achieved number 10!